This week, I fell while I was running and broke my nose. I know, people don't usually land on their noses. 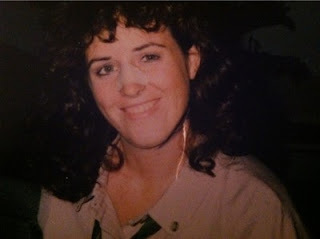 I got to thinking about the time before when I broke my nose, 24 years ago. Earl and I were dating on and off. I was standing on his front porch talking to someone when Dave called my name. I turned toward Dave and a frisbee cracked me in the middle of the nose. And that broke my nose. No blood. Just snap. 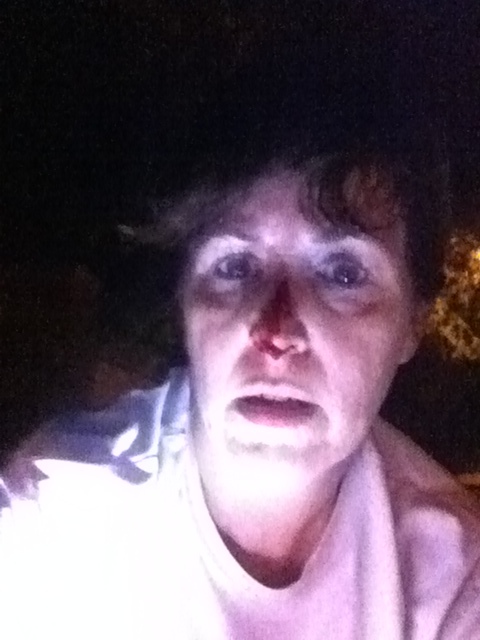 This photo from that first broken nose is very different from this week's break. Earl keeps this picture in a frame. Maybe that's when he fell in love with me. I did end up having to have surgery to straighten my nose after that. And I was a single woman, driving myself to the doctor, asking friends to pick me up and take me home after procedures and surgery. Dave, the guy who broke my nose, lay on the bed reading a book aloud to me when my eyes watered too much to open them. When I broke my nose this week, it was very bloody and it helped rule out a medical career for my 16-year-old who came to pick me up and hasn't been able to look at me all week because of the wounds. I won't run the bloody photo again, but if you want all the details, I blogged about it here. I think I've done pretty well this week. I went to work that same night after I broke my nose and I've worked the past four days. One more day to teach -- at 9 this morning -- and I'll get a day off tomorrow in return for my fortitude. Hope everyone else had a calmer week than me. Earl and I watched a movie on one of his two nights off and when we got to the end, we looked at each other and said, "Good movie." Many times, we watch a French movie and feel a little depressed at the end. I was trying to explain this movie to my friend Angie at work yesterday, and she said, "That sounds like the lamest movie ever." Okay, maybe my description wasn't very good, so let me try with you. 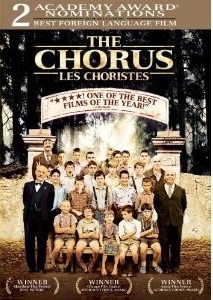 Les Choristes, The Chorus in English, begins with a white-haired orchestra director in New York. He received a phone call from France saying his mother has died. When he returns home for the funeral, an old school mate arrives with a book written by a prefect of their school. The movie then plunges into the past. That past follows Clement Mathieu, who has failed at a number of jobs, as he takes a prefect job in a reformatory school for boys. The school is, of course, run by a tyrant who beats them and puts them in solitary confinement for the slightest infraction. Mathieu tries a softer approach and the anticipation is that he will pay the price for letting up on the boys. He carries with him a leather satchel that he locks away in his room. The next day, he finds the lock broken and a clutch of boys is crouched in the bathroom with the contents of the satchel spread out before them -- music that Mathieu has written. He finds the boys and snatches back the music. As he yells at the boys, another teacher comes in the bathroom to find them. Mathieu claims they are having choral practice so the boys don't get in trouble. The teacher gives Mathieu a look that accuses him of things that teachers in boys' schools should not do and says he will not report him this time. As Mathieu tries to control the unruly boys in their dorm at night and in a study hall, he decides to begin a chorus. As you might predict, the chorus turns around the boys, especially one who is in trouble constantly and whose beautiful, single mother works two jobs. The boy has a clear, haunting voice. This movie has many of the things you would expect in a movie about trying to save children that others have written off, so what makes it different? Inspiring? I think it's the actors. A cute little guy named Pepinot waits by the gate everyday, sure that his father will come for him on Saturday, but his parents were killed during the occupation of World War II. The movie was nominated for 2 Academy Awards and won at film festivals in Chicago and Austin. The ending is hopeful, although all of the problems are not miraculously fixed. We're trying a little experiment at my house and it seems to be working. About a week ago, I started letting our older cat outside. He's been an indoor cat since he came home to us about six years ago. Tupi is the elegant tuxedo cat with the giant paws that have extra toes. He's always been pretty laid back, but in the past year or so, he started peeing outside the litter box. At least that's what we thought when we would find cat pee. And how would we find the cat pee? The younger cat would go to the spot and scrape around it, like he was trying to cover it with cat litter. We took Tupi to the vet again and again. He gave him shots of antibiotics for a urinary tract infection. We paid $50 per bag for special urinary tract health cat food. All to no avail. Finally we started to see Tupi pee. He didn't squat down like he would in the litter box, instead, he stood straight up and his tail quivered as he peed. one year, he wouldn't have misbehaved. I found an article at Cornell University that described this exact action and called it "spraying." Of course, Tupi has been fixed, but according to Cornell, about 10 percent of male cats that have been fixed can spray. Weren't we lucky to be among the 10 percent. Then I started to correlate the spraying with the times that Tupi did it. Mostly, it was in the morning when the outdoor cats were traipsing over to the neighbor's house for breakfast. She made a habit of feeding all the stray cats. Some of the outdoor cats didn't seem to bother Tupi. He'd sit on the other side of the screen from a long-haired gray and white cat while they batted at each other. But one particular cat drove him crazy. This cat was black and white, just like him. Maybe he felt like he was seeing himself enjoy freedom. So when we had a little spare money, Earl and I went to Petco and bought Tupi and handsome purple collar with little white paw prints. We had a purple heart engraved with our phone number and address. We left the bell on his collar as a warning to any birds he might be chasing. We put the collar around Tupi's neck and we let him outside. He was hesitant at first, afraid we'd scoop him up and plop him back in the house. After a while, he found a patch of dirt and rolled in it. He crouched on one side of the chain link fence and growled at the dogs next door. He has seemed to adjust. Most of the time he spends lying in the yard, surveying his kingdom. One day I found him lying on the porch swing with his friend the white and gray cat lying in the chair next to him. I haven't seen him spray and haven't smelled any evidence of it. I guess he just wanted to get outside and protect the house from the other cats that prowled around. Now, I just have to figure out how to explain to the younger cat that he doesn't get to go outside unless he starts acting up. Some parenting lesson, huh? On a humid Friday afternoon in August, twenty-four-year-old Abhay Setty sat cross-legged on the grass in front of the Fox and Hound restaurant and bar in the tired college town of Kent, Ohio. He took occasional bites of a floppy slice of pizza while writing in a little notebook balanced on one knee. Next to him on the grass was a stack of books, the top one open, at which he occasionally glanced as he wrote. He didn't want to be inside the noisy, dim bar, and Kent seemed not to have heard of outdoor dining. A steady stream of cars drove past on the five-lane highway. Across the highway at the entrance to campus, was a metal archway, spelling out Kent State University in blue letters. The campus itself was quiet. It was happy hour time, which to Abhay was a misnomer, because it seemed the saddest part of the day. The air was heavy and still. Well, I like the very beginning of this paragraph and the image of the floppy pizza, but then she loses me a bit. "He is not interested in a girl who is too forward." Mrs. Shankar had a way of lifting her upper lip when she talked, which exposed her long front teeth and made her look like a rodent. "She must be able to adapt to his way of life. He was raised to be decent. He will treat his wife like a queen. But he will her king. And she must know that." I guess I'll find out if I like it. What do you think? I was making fairly good time during my run this morning. It wasn't 6 a.m. yet and I had finished half of my five mile run. I turned onto a dark side street and wondered whether the headlamp I was wearing over my hat really helped me see the road better. But I didn't have time to ponder it for long because my foot landed in a pothole, my ankle turned and the momentum propelled my body forward to a landing with a crunch, on my nose. I heard the bones crack. My nose? Who lands on their nose? I didn't stay on the ground for a second because I could feel the blood gushing. 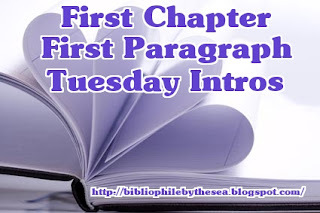 My nose grew thick with blood and mucous, and I coughed to catch a breath. I picked up the fallen hat and headlamp, but stayed bent over at the waist so the blood would not pour down my front. I let the thick, red drops pool on the asphalt as I reached for my phone. I carry my phone with me on runs because it has my music and it keeps track of my miles. Today, it offered me rescue. About two miles from home and bleeding profusely, I dialed someone who I knew would have his phone close by no matter the time -- my 16-year-old Tucker. "Hello?" his sleepy voice went up on the end in a question. "I think I broke my nose. Can you come get me?" I said, my voice clogged as I tried to breath and talk at the same time. "You broke your arm?" he asked. I told him my general location then said I would go back to the closest main street so he could find me. I stood on the corner, still bent over dripping blood. An early morning walker passed by. "Did you lose something?" she asked in the darkness. I must have looked like a basketball player searching for a lost contact lens on the court. I told her an abbreviated version of my accident and she handed me a tissue to wipe up some of the blood. That little tissue didn't stand a chance. Then the woman walked on. I kept glancing down at my hand, my knuckles. They felt sore, but I didn't see any blood where I had scraped them. Within minutes, the knuckles had swollen to a walnut-sized bump. "Oh..." was all I could say. I felt miserable but refused to give in to moaning in pain. The bleeding subsided enough to allow me to sit down on the curb without coating my shirt in red. I saw a car a block away slow at the intersection then creep forward. I swung the headlamp I held in my hand as a kind of signal light. My phone rang, and I told Tucker to turn toward the light, but not in a death and dying kind of way. The car raced down the block then and I limped into it. My knee was skinned and bleeding too. I climbed in the car and Tucker recoiled in shock. He handed me towels. "Can you wipe that off?" he asked. I'm sure he meant to be concerned rather than disgusted. I didn't realize at the time that I had scraped the skin off my nose, so bleeding from the outside and inside. "I think I might have broken my hand too," I said motioning toward the swollen knuckles. "Oh, God," he said. Right then, I ruled out any sort of medical career for him. He drove home like I was in labor and might give birth in the car. My poor husband had just pulled the car in the garage 4 hours before, having driven home from New York. Still he pulled on clothes and accompanied me to the Ohio State emergency room, all the while predicting he would be accused of spousal abuse. About a dozen xrays and five hours later, the doctor sent me home with some pain killers, antibiotics, a wrapped hand (just bruised not broken), and a referral to an Ear Nose and Throat doctor for follow up on my broken nose. What have I learned from this experience? Maybe not as much as I should have. I asked the doctor before we left, "So, I don't usually fall on my nose. How long until I can run again?" "Give it at least today," he said with a pat on my arm. "Truthfully, it's all going to depend on when you can breath well enough to run again." 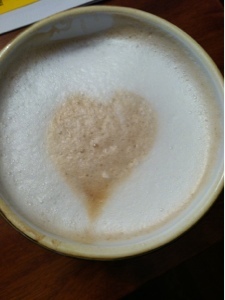 I was sipping my coffee the other morning when I looked down and saw a heart in the foam. It must be a sign that I'm loved. My mom called one night this week. "I just wanted to find out how Tucker was," she said. Tucker, our remaining child at home with his two older siblings at college. He's 16 and frequently sullen, but sometimes buoyantly friendly. There's no predicting which one he'll be. "He's fine," I said. "He got a 97 on his chemistry test." He works out three days a week after school to get ready for swim season. He spends a lot of evenings fetching his girlfriend from her college dorm 15 minutes away and bringing her back to our house. She's probably here for dinner three or four nights a week. "I saw that they'd broken up and didn't know who did the breaking up, but wanted to make sure he was okay," Mom said. She's friends with Tucker on Facebook. I'm not. I never know his status in relationships or otherwise, unless he volunteers it. "Really?" I asked. "She was just here last night. She was going to take the bus back to school and we told Tucker to drive her." After I talked to Mom for awhile, I called down the basement to Tucker. He spends a lot of time playing Xbox or watching TV in his man cave. "Who broke up with whom?" I asked. "Don't worry about it, Mom," he said. "But you're okay?" I called. "Yeah," he said, with that tone that includes the word "Duh!" even though he didn't say it. "We're not dating but we're still together." "Oh..." I had no idea what that meant. But I do know that when I got home from running errands last night, she was here again. She's a sweet girl, but the bridge between a girl in college and a boy in high school is pretty great, even if they're only 15 minutes apart. Still, maybe they've figured out how to take the sting out of break ups. On Facebook, they're not a couple any more. In real life, she was here three nights this week. I can't figure it out, so I'll just make dinner for the both of them and stop trying to solve the puzzle. Every woman loves a compliment. I'm lucky that I'm married to a man who continues to compliment me, but sometimes I'm suspicious that his compliments are colored by the fact that he loves me. My husband would also tell you that I'm fairly oblivious to men who flirt. That's what he told me when I came home from the library a few weeks ago and told him the librarian had erased a missing book on CD from my library card. I couldn't find the book on CD anywhere in the car, so I asked the librarian to see if it had been returned and not checked in. He looked on the shelves and told me that, although it wasn't there, he'd take it off my card. "Just return it if you find it," he said. When I went home, I told Earl about the interaction and commented that the librarian was very kind. The next week, Earl cleaned the car and found the missing book on CD. I returned it and felt kind of sheepish. The librarian who had helped me wasn't around so I didn't have to confess my mistake. But when I went to the library again this week, he was there. "Oh, hello," he said as he walked past me while I was browsing the shelves. I might not have interacted with him again, except the computer popped up a warning that I needed to pay my fines before I could check out. I moved to the main desk with my stack of books and started to sign in on a different computer where I could pay my fines. The librarian stood behind the desk. "You know," I said, "I found that book on CD that you took off my card." "That always happens," he said. "I was glad you weren't here when I returned it. I would've been embarassed," I said. "I peeked to make sure you weren't here before I came in with it." "Yeah, cause I would've held it up and told everyone," he said. He turned to a computer behind the desk and said he could help me with my fines and checking out. He remembered my name and already had my account up on his computer. I stepped over to the other part of the desk. "I remembered your name from last time," he said. "I remember because I wanted to tell you that you're one of the most beautiful women I've seen." He turned to run my credit card through the machine to pay off my fees. "Is there a 'vote-for-your-favorite-librarian contest' going on?" I teased, looking around. "No, really. I mean it. I'm sure you hear that all the time." Well, surprisingly, other than my husband, people don't tell me I'm beautiful. And although I didn't say that, it did make me realize that I'm not wearing a wedding ring, not since my ring finger started breaking out this summer. That would have been a perfect chance for me to mention my husband to the librarian. But, I have a book coming out soon and I would love to have a librarian on my side when it comes time to recommend buying copies of the book. So instead, I said, "Ahh, I'm too old to hear that any more." "Well, I'll remind you every time you come in because you should hear it," he said. And I left the library with my books, feeling a little awkward, but my spirits slightly buoyed. It's not everyday a woman gets told she's beautiful. But maybe we all should. I'll have to admit that I picked this one up because of the book cover. What do you think? If you aren't sold by the book cover, I guess we should move on to the first paragraph. It was a Friday when the girl came into the Archives for the first time, the first Friday after they'd changed the clocks. Spring ahead, fall back: Kathleen had once learned some rhyme about that when she was a schoolchild, but she no longer remembered it. It had been some time since she'd been a schoolchild. This was early November, the leaves mostly down, lying wet and slick all over Boston. "I'm going to bed. Came to say good night." Her voice was rough in the semidarkenss of the hallway. "Okay," said Natalie, but her mother didn't leave. Natalie didn't look up, just continued typing. Because there are too many secrets. That sounded idiotic. She deleted it. Because my father left us. Worse. Delete. Because I want to know where I came from. She let that one stand and considered it, studiously ignoring her mother's presence in the hallway. Our neighbors have a 16-year-old son, just like we do. 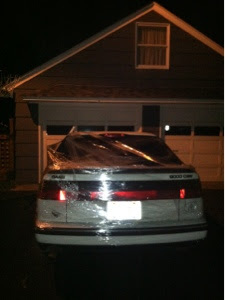 One morning this week, as I was walking through the dark to start my run, I noticed the neighbors car looked funny. I thought maybe they had done some work to it then covered it to keep it safe. Until I got closer. 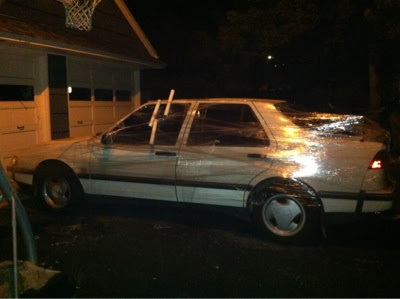 That's when I saw that the entire car was wrapped in plastic wrap. 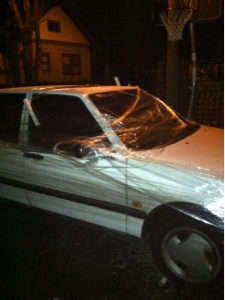 Whoever had wrapped it, had even left the empty rolls stuck to the car. It made me laugh, because I figured the prank was all in good fun. When it got to be around 6 a.m., I texted the mom to warn her that her son might need a little extra time getting out of the driveway that morning since some friends had decorated his car. "Bring scissors," I warned. I saw the neighbor at the football game last night. He said the scissors cut right through the plastic wrap and they had it cleaned up in minute. That makes it a bad prank, he explained, because it was so easy to clean up. Now those strands of toilet papers in trees, those drive him crazy. It started when Sheila and I went to our regular place for coffee. A yellow paper stuck to the wall announced a pizza crawl. We'd heard of pub crawls, but I'd never been on one. The pizza crawl was the same kind of thing but we would go from pizza place to pizza place then vote at the end for the one we liked best. "That sounds like fun," I commented last week. 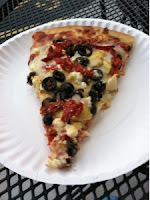 This week, we were back at the coffee shop with another friend who pointed out the pizza crawl. "Yeah, we were thinking about doing that," I said. So when I got home, Sheila had sent a message to our group that said she and I were going to take part in the pizza crawl. "Wait. I don't think I committed to that," I responded by email. "I think you did," she replied. So that how I ended up walking to our small downtown on Thursday evening. I stopped by Sheila's house first where she blended up a couple of margaritas and put them in to-go cups, those cups people use to get iced coffee drinks, with lids and straws. I like to think of myself as a rule breaker, but I was pretty nervous about walking around with an alcoholic drink. We have open-container laws here, which means you can't walk the streets with an open drink. Sheila pointed out the drinks were closed cause they had lids. I warned Tucker that he would need to come bail me out of jail if I got arrested. Our first stop was right around the corner. A thin crust white pizza, which meant no red sauce. We picked one that had tomato slices with dots of spinach. 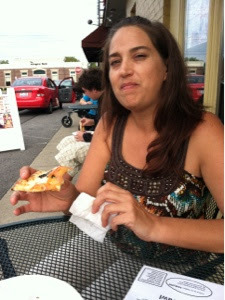 I liked the flavor of olive oil and that the pizza wasn't overwhelming. At the very first place, Sheila and I agreed that if we tried to eat a whole slice of pizza each, we wouldn't make it very far. So we decided to buy one slice of pizza at each restaurant and split it in two. That way we could try more. Each slice of pizza was $1. By the time we had finished, we had visited 6 pizza places and spent $3 each. Not bad. After the first nearby place, Sheila suggested we try some of the farther flung pizza places that we wouldn't usually visit, so we began hiking along the road and hit the two farthest ones. One of them was in a bar. We walked in to head-banger music. Sheila called it 80s hair band music. She admitted that she used to hang out in this bar and do her homework when she was in high school because they were lax about checking IDs. She pointed out the bathrooms: "One was for using the bathroom and the other was for doing drugs." After we got our slice of pizza, she texted her youngest, 14-year-old Thomas, and told him and his friends not to walk all the way to this bar for pizza. It didn't seem like a good idea for the unaccompanied teenagers to come to the bar. Of course, Sheila didn't have that rule for herself when she was a teenager. The pizza in the bar was saucy and cheesy, but not too spicy. When we finished, that was our 4th shared piece of pizza, equivalent to two whole pieces. I was starting to get full. We decided to head to the farthest place in the opposite direction to try a piece of pizza another friend had recommended. So we started walking. Throughout the evening, we walked 4. 6 miles, according to Gmaps pedometer. Walking in my Birkenstocks, after running 4.5 miles that morning and working 8 to 3, I felt the day wearing on me. We sat down at the last place to a piece of pizza with artichoke hearts, black olives and dried tomatoes. The toppings were tasty. I ended up eating the toppings and leaving the end of the crust. Finally, Sheila and I walked toward her house. 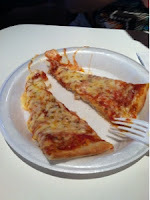 We stopped at one last place and grabbed $1 slices of pizza to take home for our kids. I bought two very heavy meat lovers slices to take home to Tucker, covered with pepperoni, sausage, bacon and meatballs -- holy cow. It was worth it though, cause he was happy, and I could finally put my feet up -- full of pizza and maragarita and enough exercise to not feel guilty about it. Next time, I think I'll try a pub crawl. Earl works evenings, so most evenings I'm home alone or chaperoning Tucker and his girlfriend. On Earl's two evenings off a week, we try to find something fun to do. Tuesday night, we walked down to the library and borrowed a couple of movies then went to a local coffee shop. We sat at tables along the sidewalk and enjoyed the beautiful September night. When we had walked home, we watched one of the movies. Made in 1995, French Kiss with Meg Ryan and Kevin Kline is a great romantic comedy for anyone who loves France, like I do. Earl had never seen it before, and I only fell asleep for a small part of the movie. Kevin Kline plays a Frenchman, Luc, who is a thief. I wondered why they had chosen him to play a Frenchman and when I searched it online, I found that the role was originally written for Gerard Depardieu. I like Depardieu, but I can't imagine Meg Ryan falling for him. Kline has since played other French-speaking parts. The plot is that Meg Ryan is petrified of flying so she doesn't go overseas with her fiance. He meets a French woman and falls in love. 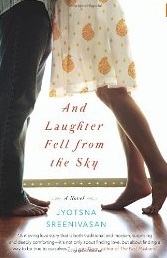 She gets up her nerve to fly over and win back the fiance, but meets Luc on the plane. He hides some contraband in her bag and they are thrown together. Although I love France, I still prefer to watch American movies made in France. 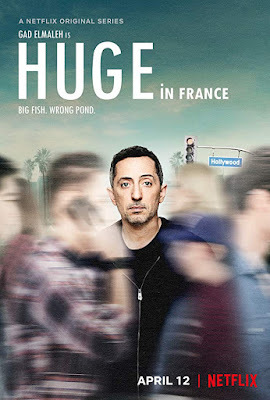 The problem is that comedies in France aren't generally funny. Someone almost always dies. But the other movie we watched on Earl's night off was French, billed as a romantic comedy. We were prepared for bodies to start stacking up as the hilarity ensued. The movie was called Heartbreaker with Vanessa Paradis and Romain Duris, French actors. The premise is that Duris plays Alex who, with his sister and brother-in-law, runs an elaborate business to break up couples. The examples they gave were a brother who paid them to break up his sister and her lame boyfriend, and a father who hired them to keep his daughter from marrying someone boring. The beginning was fun as Alex and his crew went to elaborate lengths to convince a woman that she deserved more than the man who preferred to stay by the pool and watch a wet t-shirt contest. Of course, Alex meets his match when he is asked to stop the marriage of Juliette, an independent woman, to a British philanthropist. Alex takes the job because he needs the money, even though it goes against his principles. He usually only breaks up couples who are unhappy or a bad fit. Juliette puts up quite a fight, which makes Alex fall in love with her. I won't tell you how it ends, but surprisingly, no one dies, which makes it 'ilarious, as the French say. Both movies were full of lovely French scenes. On Wednesdays, I don't have to go to campus to teach. I hesitate to say I don't have to work, because I still do plenty of work; I can just do it in my pajamas if I want to. But this morning, I planned to meet Sheila and Tracie for coffee. Since the three of us were meeting, I suggested that Sheila bring her Mahjong set. And she did, even though the case looks like a machine gun case. If you haven't played mahjong with tiles instead of on the computer, you're missing out. We have these nice ceramic tiles. They're smooth and satisfying to hold in your hands. The goal is to choose a hand and try to get the tiles to create that hand. It looks complicated, but after a couple of games, everyone gets the hang of it. This morning, Sheila won three games in a row, before Tracie and I had really figured out what we were doing. She looks very satisfied in this photo doesn't she? 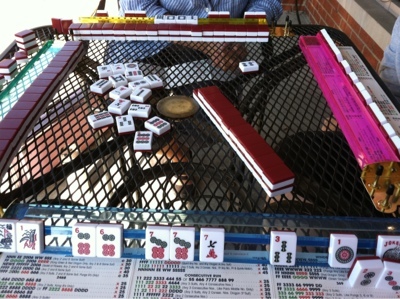 It felt pretty decadent to spend a glorious September morning sitting outside the coffee shop playing mahjong. A number of people stopped by to watch us and comment. One woman went so far to ask, "Do you have kids in school or something?" as if there could be no other excuse for sitting and "wasting" our time on a weekday. Of course, I work and Tracie works and Sheila is still homeschooling, so we made no excuses for our fun. 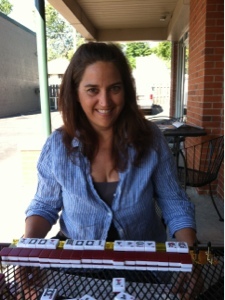 Mahjong with coffee, not quite as fun as mahjong with wine. But time spent with friends -- priceless. I'm still having a hard time finding a book that grabs me. 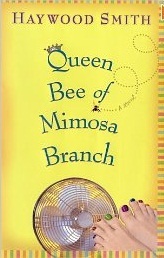 I'm going to try one recommended by anotherblog's First Chapter First Paragraph Tuesday a few weeks ago -- Queen Bee of Mimosa Branch by Haywood Smith. I took the long way home that fateful midsummer day last July, maybe because I still couldn't quite believe what I was about to do. So traditional southern matriarch. I hope these are characters I fall in love with. "Now, honey," she said in that same singsong she'd used when I was ten. "You know how you get when you don't have your protein with your carbohydrates. Eleven o'clock and there goes the blood sugar, under the basement. I'll just scramble up a few, shiny, like you've always liked 'em." Maybe you all will have some suggestions for me. Yes, I know that the title is a cliche, but I've found that I wish I were ignorant about some things during this political season. Whether you're liberal or conservative, don't you wish you didn't know the politics of the companies you buy food and laundry detergent from? Recently, company leaders have been coming out in support of one politician or another. The owner of Papa Johns pizza complained that under the new health care law, he would have to charge 12 to 14 cents more per pizza. (To me, that seems a small price to pay for health care. It sure wouldn't dissuade me from buying a pizza.) 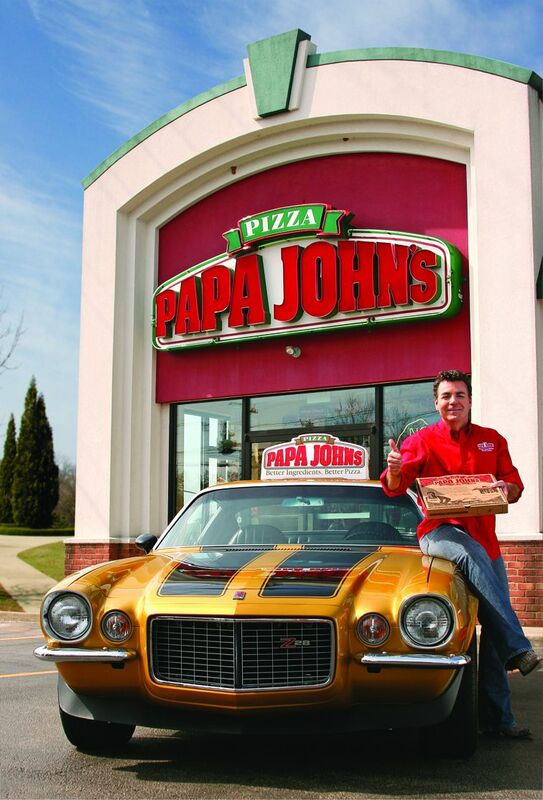 But truthfully, I'd rather not know Papa Johns' politics. I enjoyed their pizzas. Notice that is past tense. Now I feel like I don't want to support a company that automatically plans to push any costs onto the customers rather than the shareholders and doesn't see its employees worth insuring. Same thing with Chick Fil A. They have delicious chicken sandwiches, but I don't feel like I should go to a restaurant that openly discriminates against gay people. There are no laws they are being forced to follow, so why did the owner share his feelings on it? Religious beliefs? Plenty of people in the 60s thought it was antiChristian for blacks and whites to marry. Would we have supported them? Taking a stand pro-discrimination is always the wrong side of history. So now I'm getting hungry just because of politics. Warren Buffett, CEO of Berkshire Hathaway, makes no secret of his politics either. He thinks he and other rich people should pay more taxes. If people are conservative, are they taking their business away from Geico and Fruit of the Loom and other companies owned by Berkshire Hathaway? Companies should be smarter. They may want to complain about taxes or regulation or policies, but speaking out can lose them 50 percent of their customers, which seems like its a greater financial hardship. Keep your politics to yourself, companies, and let me keep eating your delicious food. Last February, when I had my birthday, I got a facial at the local Aveda shop. Pattie, the woman who does facials at Aveda, has seen me about once a year for the past 10 years, so we always catch up. This year, as she smoothed my hair off my forehead and attached a velcro headband to hold it in place she asked me my secret. "How have you avoided worry lines between your eyebrows?" she asked, pointing to her own parentheses just above the bridge of her nose. I shrugged. I hadn't really thought about it. Until Friday, when I looked in the car mirror and yikes! I didn't have two parentheses between my eyebrows, I had parentheses plus a dash. 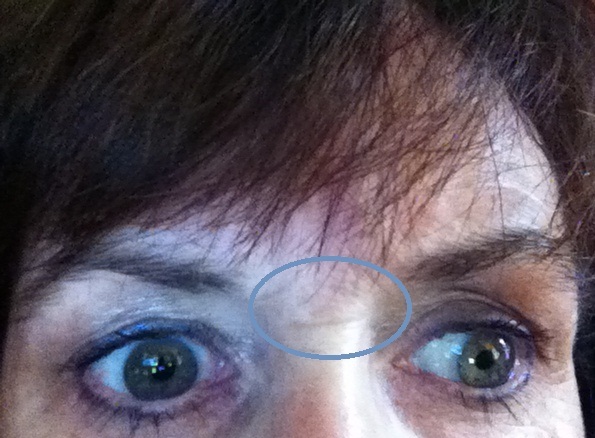 That space above my nose, right before my forehead begins is now crowded with punctuation marks. How has this happened in seven months? I know I've been juggling funds recently with two kids in college, and, face it, money worries make some of the biggest impacts on our beauty. Also, this whole teenager, young adult thing is having a huge impact. I used to think if I could just get a full night's sleep that everything would be wonderful. Now I know that bigger worries awaited me than getting the kids to sleep through the night. But, with two kids away in college, my day-to-day worries about them should lessen. The one child left at home goes to school each day, works out three days a week, picks his girlfriend up from college to spend the evening at our house, and gets home by his curfew on weekends. Okay, he did have a minor fender bender Thursday night, the night before I noticed these new marks. No damage to our car and nothing to the other car, except a loose bolt on the license plate. But the young man he bumped blew up at Tucker and made the whole scenario worse. I'm hopeful that these parentheses will fade rather than deepen, as the year of college payments reaches its end in March, and maybe I'll have two months of a line free forehead, before the payments begin again. In Florida last month, we hopped in the car and took off. We hadn't gone far when we noticed a hitchhiker. Just in case you had trouble spotting him, here's a close up. I like to think that he climbed off the car when we were stopped. I'm going to stick with that story. Sometimes I get the best ideas, but I rarely follow through on them. This morning as I was running in the dark, I came up with another one. I run in the street because it's less likely to be uneven and trip me up like the sidewalk does, plus the asphalt is better for my knees and joints than the concrete. I run against the traffic so I can see those few cars that might be headed my way in my small town at 5:30 in the morning. I consider it my responsibility to get out of the road if a car is coming and it doesn't see me or can't get over. As I turned onto a street with very few streetlights, I realized cars might not see me since I don't wear any lights. I have reflectors on my water belt and my shoes and my hat, but if a car doesn't have its lights on, it might not see me. If a car didn't have its lights on, I would hear it, I reassured myself. Aha, but what if it's an electric car, you can't hear those, the annoying, worrying voice in my head responded. That is a problem that people have been working on: how to make electric cars louder so the vision impaired, or runners in the dark, aren't surprised by them. That's when I came up with the genius idea. The tires have to go around for the car to move. When I was a kid, we had these great plastic straws that went on the tire spokes of our bikes and made the best t-t-t-t-t-t- noise as the wheels rolled down the street. That's just what we need on electric cars. 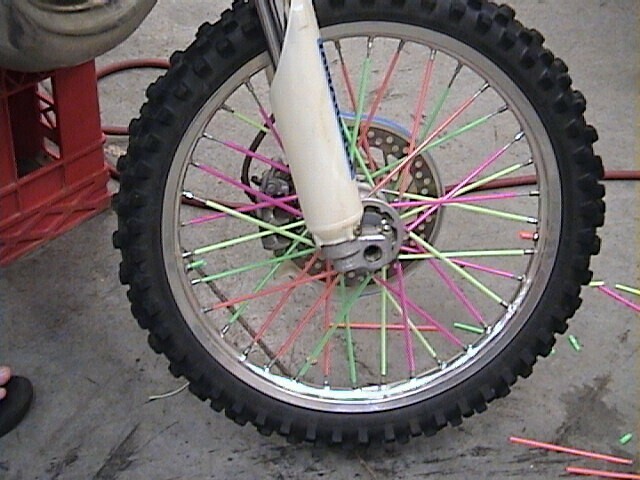 Here's a photo from Yellow Dog Racing to illustrate the way the tires look. I think these kinds of colorful accoutrements will spice up the electric car images too. 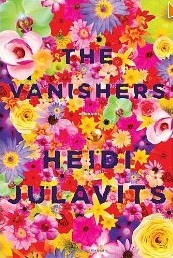 I have about three books going right now, but I'm not really satisfied with any of them, so I plucked one off the shelf and here's the intro for The Vanishers by Heidi Julavits. The story I'm about to tell could be judged preposterous. Fine. Judge how you must. Protect yourself by scare quoting me as the so-called psychic, the so-called victim of a psychic attack Quarantine this account however you must so that you can safely hear it. What happened to me could never happen to you. Tell yourself that. Even though what happened to me happens to people like you all the time. Hmmm. That doesn't give me much to work with. I arrived at Madame Ackermann's house to find her in a manic frenzy. Her feet were bare, her hair plumed from a Pucci scarf knotted on the top of her head, her eyes racooned by day-old mascara. I hope I like this one. I finished In the Bag by Kate Klise yesterday and it met my expectations as a fun, quick read with dabs of foreign travel and emotional characters. I'd recommend it. I'll let you know what I think about The Vanishers. I was going to save this book for First Paragraph Tuesday, but it's such a quick read that I'm afraid I'll be finished with it today. 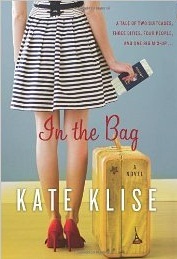 So I wanted to tell you about In the Bag by Kate Klise. Truthfully, this has been on my shelf for awhile. The cover says "A tale of two suitcases, three cities, four people and one big mix-up." I thought it sounded cute. But it didn't compell me to choose it from among all the other books. 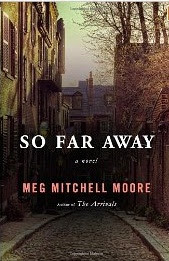 Yesterday I did and I learned something about the book that would have made me start it much sooner -- it's set in Paris. Hellooooo. That definitely would have hooked me. Here's the premise: a mother who's a famous chef in Chicago travels to Paris with her teenage daughter to avoid prom weekend at home, since the girl doesn't have a date. A father, who organizes art exhibits, travels from St. Louis with his teenage son to Madrid. The father is working so he takes the son along to enjoy the atmosphere. They're all on the same plane from St. Louis to Paris and the teenagers accidentally end up with each other's bags. The teenagers start emailing each other trying to return bags and end up in an online romance. Each character gets to tell his/her tale. We see the mom and the dad worrying about their teenagers (something I'm familiar with). We see how clueless the parents are from the kids' perspective. The kids come up with such a stupid plan to meet each other, that it seems genuine. No offense to any teenagers out there, but the more I get to know them, the more I realize many teenage ideas are ridiculous. And, added to the fun, the dad had accidentally spilled wine on a woman on the plane. Guess who that is? And he can't stop thinking about her. This is a fun read if you get a chance to pick it up. I just wish there'd been a little more emphasis on the setting to get me and all the other Francophiles to pick it up. 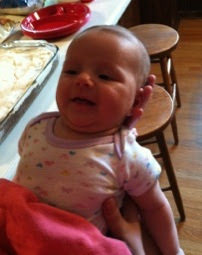 Our niece's baby Regan is two months old now and starting to interact with us. At Grace's going away to college party, she actually smiled a few times. Of course, nothing beats those big-eyed baby photos. 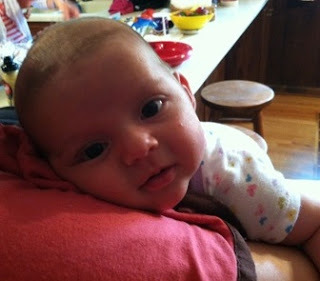 Hope your day is as restful as snuggling up to a two-month old baby.